Islands In The Sea: The Library! | Book 5 - $13.99 : Beneficial Zone, Everything is permissible, not everything is beneficial! 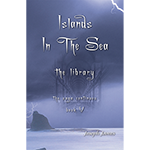 Islands in the Sea: The Library! | Joseph James (In Pre-Press) RESERVE YOUR COPY NOW! Dan, Susan, John, Nikki, Roger, and Jessica’s original team has continually been growing globally, but what three newcomers add is beyond belief. It stretches their faith and tests their courage. They thought they had defeated the cult and their FBI and SIS friends did too, but then the unthinkable happens. All of their friend’s lives are now in imminent danger and all hope seems lost. It was the ultimate ambush and it seemed to come out of nowhere. Danger walks untouched through their front door and menacingly stares them right in the face. Previously, things were easy with a small team because they knew who they could trust, but now the general public is among them. Their friends from Australia, the U.K., and Africa are back in town, but there’s something new in town. It’s something that will change the whole world. Alex and the angels are again on the scene some new ones as well. Suddenly, three strange lights are seen falling from the sky. The darkness rages. Join the new team as they discover new hidden clues in the caves and follow the symbols overseas in a race against time.